Master Wood Box Set — A luxurious wooden keepsake box filled with professional-quality oil colors, mediums, brushes, and accessories makes a beautiful and inspiring gift for yourself or any aspiring painter. *Please refer to the item specs tab for a full listing of all paints and brushes included in this set. Excellent Wood Box Set — A magnificent walnut-stained hardwood box with brass fittings, closure, and clasps contains a treasure trove of Rembrandt art materials for the oil painter. Starter Set — Contains 6 colors in 15 ml (0.5 oz) tubes, including one each of Zinc White (Safflower), Permanent Yellow Medium, Permanent Red Medium, Carmine, Ultramarine Deep, and Phthalo Green Blue. 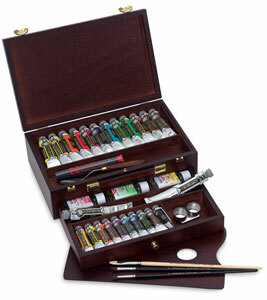 Professional Wood Box Set — This finely crafted wood travel box is the ideal gift for the professional or aspiring artist in your life. It contains a variety of Rembrandt Artists' Oil Colors and other essentials. 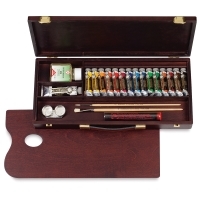 Traditional Wood Box Set — A handsome, walnut-stained wooden gift box contains a full range of Rembrandt Oil Colors, mediums, brushes, and accessories. Basic Set — Contains 10 colors in 15 ml (0.5 oz) tubes, including one each of Titanium White, Permanent Lemon Yellow, Permanent Yellow Medium, Permanent Red Light, Permanent Madder Medium, Ultramarine Deep, Sèvres Blue, Permanent Green Deep, Burnt Sienna, and Ivory Black. 41 Tubes of professional-quality oil color, including 19 colors in 15 ml (0.5 oz) tubes, 18 colors in 40 ml (1.35 oz) tubes, 3 colors in 60 ml (2.03 oz) tubes, and 1 color in a 150 ml (5 oz) tube. Please refer to the item specs tab for a full listing of all paints and brushes included in this set. All Rembrandt Artist's Oil Colors are AP non-toxic, except for the following colors which bear the ACMI Caution Label. 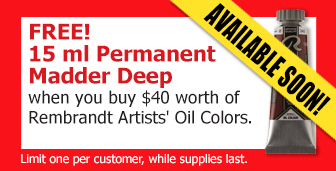 Rembrandt Oils are produced with the highest color strength possible, using pure pigments. The pigments are ground to extreme fineness in a binder consisting of the purest linseed or safflower seed oil, resulting in an oil paint whose texture is exceptionally smooth, creamy, and even.